The World Press Photo organisation has released research – The State of News Photography – over the past two years based on responses from photographers who have submitted entries to the WPP awards. They get an extraordinarily high level of response, with almost 2000 of the 5000 or so entrants participating. Roy Morgan would kill for such a representative sample! In some ways it’s a frustrating report – for instance the findings on how many photographers work full-time and how many earn all their income from photography seem to be contradictory, unless we here at ProCounter are missing something. (It wouldn’t be the first time!). Then there’s the necessarily broad brush of a global report. We read that 85 percent of photojournalists earn less than US$40K ($52K) annually, but when you dig down a bit you find that 43 percent of photojournalists from Asia and Africa actually earned less that US$10K, really dragging that global average down. So we know that photojournalists from third world countries are poorly paid, but not much more. 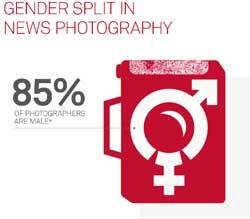 It’s worth noting, however, that the startling gender bias towards male photojournalists – once again 85 percent of respondents – is pretty well standard from region to region. Let’s get women out of the board rooms and behind a camera! Nonetheless it’s better to have an overview of the state of photojournalism than have a state of ignorance over the state of photojournalism, and this kind of research becomes more valuable over time, as trends emerge and issues are identified. • The gender ratio is almost identical in 2016 to what it was in 2015, with around 85 percent of respondents male. • Perceptions of risk are high, with 91 percent of respondents saying they faced physical risk at work. 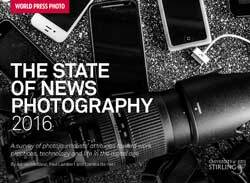 • The number of self-employed photojournalists has declined from 60 percent in 2015 to 54 percent in 2016. • Fewer respondents are working full-time, down from 74 percent in 2015 to 61 percent in 2016, with respondents undertaking other photography-related work and also unrelated work. • Working as a ‘stringer’ is a very common arrangement with 63 percent agreeing they do this at least some of the time, and 24 percent indicating this was mostly how they did their work. • This year, 37 percent of respondents said they were required to work with video in 2016 compared to 32 percent last year. Participants overwhelmingly said they preferred to work with still photographs. 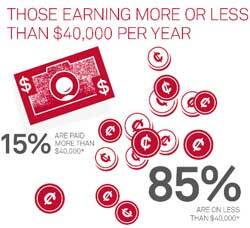 • About 13 percent of the respondents said they earned royalty income from their photographs. • The year under review saw a statistically significant decline in the use of film cameras, with just 18 percent of respondents using film cameras this year compared to 26 percent in last year’s survey. Only 2 percent use film exclusively. contrast, hue, tone or saturation. • With staging defined as asking subjects to pose, repeat actions or wait while the picture was being taken, 69 percent of respondents said they did this. 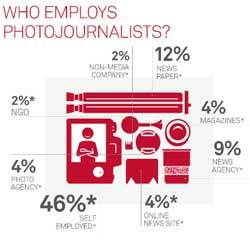 • Almost two thirds of the photojournalists who participated in this survey said their work had been used without their permission. However, as many as 35 percent of those respondents did get some level of compensation for this unauthorised usage (up from 28 percent in 2015). • Over 60 percent of respondents in this year’s survey said they were either happy or very happy with their current mix of assignments. This entry was posted in Research by Keith Shipton. Bookmark the permalink.